Trip planner: What you need to know before snowmobiling in Fernie, B.C. 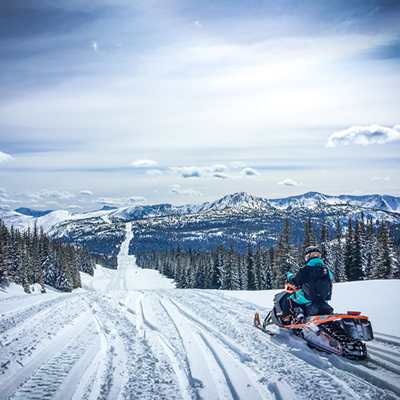 Trail map, top snowmobile trails, club contacts and other information you can use when planning a snowmobile trip to Fernie, B.C. The friendly town of Fernie in southeastern B.C. offers snowmobilers a truly authentic Rocky Mountain experience. What, really, does that mean? Well, imagine a short cruise along groomed trails taking you to fabled land of towering peaks, high alpine lakes and handlebar-deep snow. In this land, there is plenty of tree riding, plus open meadows to carve and steep hills to climb. Hopefully, this page will help you plan your next snowmobile trip to Fernie. Hard copies of the trail maps (with GPS co-ordinates, events, riding area info, etc.) are available for free with the purchase of an annual membership or day ticket at the trailheads or at the Fernie Visitor Centre, which is located at 102 Commerce Road. Please note that there are several special access management regions within the Elk Valley that can change annually. Top snowmobile trails and places to sled in Fernie, B.C. The Rolling Hills snowmobile area near Fernie, B.C. If you’re looking for family-friendly trails and/or you have multiple skill levels in your group, the Rolling Hills snowmobile area will be your best bet. Access starts at the Coal Creek Staging Area, which is only 3.5 kilometres from downtown Fernie. Have a big rig? There is room here for trucks with enclosed trailers to turn around. From the trailhead, it is a 16.5-kilometre ride along regularly groomed trails to the Rollings Hills Cabin and play area. Spend the day boondocking in widely spaced trees or stay on the trail and extend your ride into the Morrissey area. Note: There have been ongoing timber harvesting activities by a private landowner in Coal Creek, resulting in early season closures of the staging area (usually until early February). Until then, riders can access the Rolling Hills from Morrissey. The Morrissey snowmobile trails and riding area near Fernie, B.C. The Morrissey snowmobile area has some of Fernie’s best technical riding. Starting from the Morrissey Staging Area south of Fernie, a 14.5-kilometre groomed trail leads riders to the Wrangler’s Cabin. Venture past the cabin, through the meadow and you can follow the pipeline to The Notch. This popular play area has endless tree riding and access to sub-alpine bowls. There are two parking lots at the Morrissey Staging Area; the lower lot is designated for large trucks and trailers while the upper lot is for trucks with sled decks only. The Corbin snowmobile trail and riding area near Sparwood, B.C. Hard against the B.C.-Alberta border, this intermediate-to-advanced riding area offers access to high-alpine terrain. If you’re coming from Fernie, it’s a bit longer of a drive, however, since the main staging area is located just past the townsite of Corbin—which is about 23 kilometres off Highway 3 between Sparwood and the Crowsnest Pass. Starting in the winter of 2017-2018, the Fernie Snowmobile Association will be grooming the 10-kilometre trail into the Corbin snowmobiling area. The Hartley Lake snowmobile trails near Fernie, B.C. Riders with strong route-finding skills and backcountry experience may want to check out the Hartley Lake area. From the parking lot, which is located behind the industrial area east of Fernie, there is a 15-kilometre groomed trail that traces a forest service road deep into the backcountry. Keep in mind that the Hartley Lake road is a single-lane with a steep grade, so if you’re pulling a trailer, your vehicle needs to have chains to access the parking lot; it’s not suitable for large trailers. Where to buy a snowmobile trail pass in Fernie, B.C. Day passes are $25 for adults and $10 for children under 14, and you can purchase them at the trailheads or at the Fernie Visitor Centre. Annual memberships are also available at the Fernie Visitor Centre, or you can purchase them from the Fernie Snowmobile Association’s website. Follow the Fernie Snowmobile Association on Facebook and Instagram for updates. You can also check out the Snow Report from the Fernie Alpine Resort. 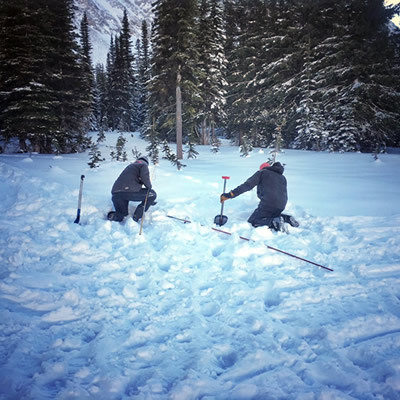 Avalanche Canada’s South Rockies Field Team, based in Fernie, publishes reports and updates on snow conditions on its Facebook page. It's important to check the current avalanche bulletin from Avalanche Canada before you head out. Fernie snowmobiling areas are in the South Rockies region forecast or the Lizard Range and Flathead region forecast. To get the bulletins on your smartphone, you can download Avalanche Canada's app from the Google Play Store and the iTunes App Store. Fernie Snow Drags - Usually held in February, the Fernie Snow Drags attract racers from B.C., Alberta and Saskatchewan. It’s a great event for spectators as well. Griz Days - Fernie’s annual winter festival is a community-wide event that takes place at the beginning of March. The Fernie Snowmobile Association usually hosts a family-friendly ride during Griz Days. Local snowmobile club in Fernie, B.C. Caretakers of this domain since 1990, the Fernie Snowmobile Association (FSA) has grown into an active organization that grooms over 150 kilometres of trails in Fernie and area. See the SnoRiders’ club profile or visit the FSA’s website to learn more. What local snowmobilers say about Fernie, B.C. See Tourism Fernie's website or the City of Fernie's website for more information about snowmobiling and other winter activities in Fernie. Driving distances to Fernie, B.C. Ghostrider Motorsports is an Arctic Cat snowmobile dealership in Fernie that offers snowmobile rentals as well. GearHub Sports in downtown Fernie has snowmobile accessories, avalanche gear, parts and support. Big Bang Bagels in downtown Fernie is a local favourite. For breakfast, many sledders head to Smitty’s. The tried-and-true national chain is located on Highway 3 and offers everything from its famous buttermilk pancakes to waffles and omelettes to salads, sandwiches, steaks and pastas. For riders with some energy left at the end of the day, there is a lot to experience in Fernie after dark. Head to the downtown centre on Second Avenue and Main Street for roughly six blocks of neighbourhood pubs and clubs to choose from. The Park Place Lodge Pub and Boston Pizza are favourites in the sledding circle. If you’re craving international cuisine, try the Himalayan Bistro, Nevados or Yamagoya Sushi. The laws governing snowmobile use differ by province and can be confusing. 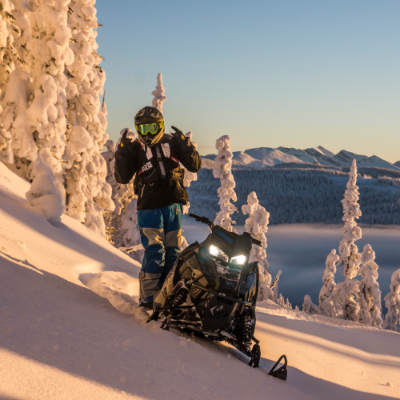 Here, we make it easier to understand what local and out of province snowmobilers will need in terms of insurance, registration and licensing to ride B.C., Alberta, Saskatchewan and Manitoba. 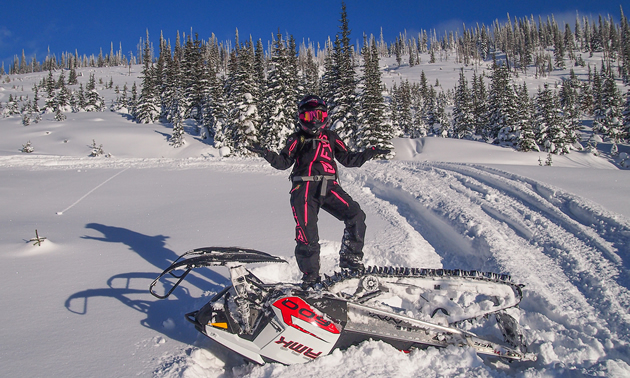 Fernie, BC Trip planner: What you need to know before snowmobiling in Fernie, B.C. 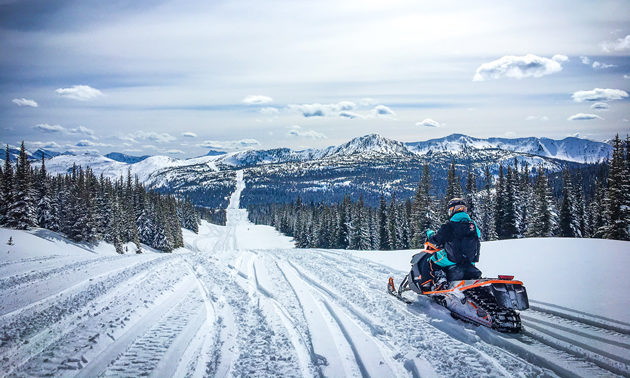 Logan Thibodeau, a second-generation, Polaris-riding thrill-seeker, sleds through Fernie, B.C. As technology, techniques and our level of riding experience change, it’s important to keep our avalanche safety training up to date.